Comments Off on Plant Sale Must-Haves! In spring, the main event for TBG members and their friends, family and just about anyone who will listen to us is The Plant Sale. Always a hubbub of horticultural indulgence, this year’s sale, which takes place over the Victoria Day long weekend from May 17 through 21, promises to be better than ever. In fact, here’s what Nancy Eaton Director of Horticulture Paul Zammit says about some of the plants he’s excited about. Actaea ‘Chocoholic’ (formerly Cimicifuga ‘Chocoholic’) I’m a sucker for perennials with dark and dramatic foliage, and this plant lives up to my highest expectations. The rich bronze to purple foliage grows to about a metre in height and is topped in late summer with fragrant white spikes of flowers. Full sun to part shade. 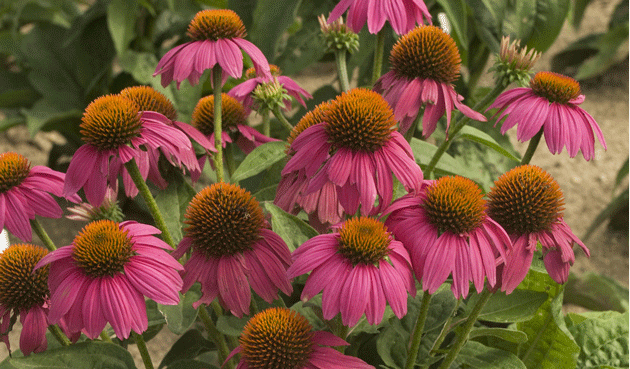 Echinacea ‘PowWow Wild Berry’ Despite the many recent introductions of coneflowers, particularly the new orange and yellow colours, this selection has stood out in field trials. Compact, well-branched, 60-centimetre tall plants produce abundant fragrant blooms over a very long period. Euphorbia tirucalli ‘Sticks on Fire’ This upright grower yields eye-catching chartreuse to gold branching stems that develop an orange colouring as summer heats up. A great addition to your garden for vertical and textural interest, it’s not always available, so we are thrilled to offer some plants at this year’s sale. Easy to overwinter indoors. Kalanchoe thyrsiflora ‘Fantastic’ Dramatic and colourful only begins to describe this tropical succulent. When I first heard about it, it became a must-have plant for my own collection, and honestly, the hunt has been worth it. I love this plant! Shop early to avoid disappointment. Leptodermis oblonga I have grown this relatively unknown small shrub for years and every year I ask myself why more people do not have this gem in their gardens. Some claim it is also quite fragrant although I have not personally experienced this. Even without the fragrance this 60-centimetre-tall shrub is a favourite. It’s always asked about when we open our home garden to the public. It combines beautifully with Hakonechloa ‘All Gold’ planted at the base. Plant in full sun to part shade. SuperNaturals grafted tomatoes Claims to fame: extreme vigour, improved quality and quantity of fruit, increased disease resistance, more tolerant to environmental stress, more abundant harvest over a longer period. We will have six varieties to choose from. Watch for other new introductions and great garden performers including: Aralia ‘Sun King’, Amsonia ‘Blue Ice’, Dicentra ‘Valentine’, Rudbeckia ‘Little Goldstar’, Brunnera ‘Jack Frost’, Salvia ‘Caradonna’, Euphorbia ‘Diamond Frost’ ‘King Tut’ cypress, Malibar spinach, heirloom tomatoes, and much, much more! Be sure to mark your calendars with the new Plant Sale dates: May 17 through 21!